It is a reviewer’s cliché, but if any recent book qualifies as an instant children’s classic, this could be it. 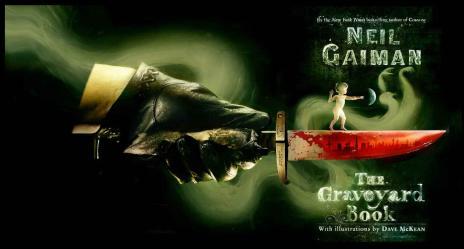 Neil Gaiman’s The Graveyard Book has been the only book ever to win both the Newbery Medal and the Carnegie Medal, and all the critical huzzahs and word-of-mouth recommendations kept it in the New York Times children’s best seller list for over a year. It could pay to get to it while the book can still feel like a personal discovery – because once the promised major motion picture version kicks in, The Graveyard Book may start to feel like a cultural obligation, akin to seeing The Wire or having a firm opinion about The Tree of Life. You don’t want this to feel like homework. Not much chance, really. Almost any child from age nine upwards into the mid teens would like The Graveyard Book though arguably, it isn’t written only – or even primarily – for that audience. It tells the story of an orphaned baby who has been rescued and raised by ghosts. The little tyke’s name is Nobody – Bod for short – and on page one his family has just been murdered by a particularly nasty villain (“The man called Jack”) with a sharp knife, and shoes polished like dark mirrors. As Gaiman has said many times, his book was partly inspired by Rudyard Kipling’s The Jungle Book, in which the infant Mowgli was raised by wolves. Both books are not linear narratives. They consist of stand-alone episodes in the life of the hero, at various stages of his childhood. As Gaiman has also said, he began the story at chapter four (“The Witch’s Headstone”) struggled very hard in the writing of chapter six (the schooldays chapter) but fared much better with the rest. 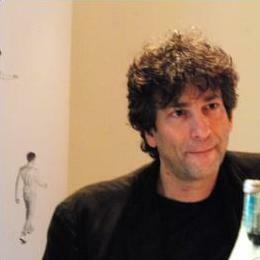 Reportedly, the book was based on an idea he got while watching his son Mike peddle his tricycle happily around a local graveyard, which set Gaiman to thinking : “ He seems at home here.” For 20 years, Gaiman carried that idea around at the back of his mind and by the time he finally settled down in 2008 to write it, he had the writing skills to do it justice. Though known for being a profilic writer – and one who even calls himself ‘reasonably facile” – Gaiman took 10 years of writing, revising and polishing (at an average rate of 2,000 words a year) to produce Coraline, his other major children’s book. Much fun (and several academic theses in future) could be had in tracing the similarities in how Kipling and Gaiman went about their business. The episode where Bod is carried off by ghouls for instance, shares obvious parallels with the chapter where Mowgli gets captured by the monkeys….but too much can be made of the comparisons. Best to be grateful that Gaiman has created a vast new audience for Kipling’s wonderful stories…which should be read afresh, without all the baggage (British imperialism, the appropriation of Akela the wolf by the Boy Scout movement, the Zionist parable that can be read into the story about the white seals’ search for a home safe from predators, the Disney feature film version etc) that has attached itself to The Jungle Book over the years. It deserves a better fate. Similarly, The Graveyard Book should be read on its own terms. Offhand, I can’t think of a more gripping opening chapter than the one that puts the murderer Jack on the stairs with his knife and headed for the nursery – only to find the baby has escaped and is just ahead of him, tottering up the hill towards the cemetery. It takes the intervention of a kindly pair of ghosts to save the toddler from being slaughtered. This act of kindness turns Bod into a responsibility for all the other cemetery inhabitants as well. If only because – cue typical Gaiman joke – it takes an entire graveyard to raise a child. Gradually, the story of Bod becomes a tale about growing up and leaving the nest. Along the way, it honours the sense of belonging that enables that transition to be navigated safely. With brilliant economy – the clarity of his writing can only be the result of constant revision – Gaiman takes us through baby Bod’s quest for security, and the evolution of his powers. Things don’t come easily for him – or at least, not as easily as for Harry Potter. The narrative constantly pits Bod’s security – should he stay at home in the cemetery and be safe ? – against the attractions and dangers of the world beyond. Strikingly, it is only when Bod begins to take responsibility for a bullied child at a school that Silas has grudgingly allowed him to attend that Bod unwittingly opens the door once again to the danger posed by Jack and his deadly crew. He does so later on, when he tries to protect his dear friend Scarlett. Bod does what’s right, gets noticed, and pays a price. So does Silas, indirectly. In this world, actions have consequences we can’t foresee, or control. It is a recurring theme. Without giving away the ending, suffice to say that the climax of the story lands Bod in the sort of complex moral dilemma rarely found in children’s books. Can the need to combat a clear and pressing evil justify putting those dear to us ( ie, Scarlett) in mortal danger? To what extent did Bod have an option? ( Discuss.) Years ago, I did an interview with Philip Pullman (Listener, January 27, 2001) where he talked about much the same point. Does Bod intuitively use Scarlett as bait? From where she was sitting, it certainly felt like it. Would they all have died at the hands of Jack if he hadn’t? This grey zone of moral ambiguity, where good intentions can have bad outcomes and bad deeds can be serendipitous – is an interesting thing to place at the centre of a book ostensibly aimed at ten year olds. At the very least, the climax of the book shows us that even good and necessary actions can have indelible consequences, and that sometimes, the people we love will judge us harshly – or not at all. As happens to all of us. We leave home (that’s good !) but our absence is felt forever by those we leave behind. No wonder many adults have felt a bit teary about the book’s last few pages. Just as in the real world, those aspects of Bod’s story will be felt consciously only by adult readers. Most 10-15 year olds will feel merely that Bod has been somewhat hard done by vis a vis Scarlett, but not to worry…because he’s now headed out for even more thrilling adventures! Yes, Gaiman has talked about doing a sequel. Silas and Bod – and maybe even Bod and Scarlett – still have unfinished business with each other. By picking out its more serious themes, I hope I haven’t obscured just how funny and exciting this book is, most of the time. Did I mention it also has ghouls, night-gaunts, Hounds of Heaven, an Indigo Man, a monstrous whispering thing called The Sleer, the 33rd President of the United States (aka Harry S. Truman) and a band of evil Jacks of All Trades ? Some parents may baulk at the presence of Death in this book, embodied here by a horsewoman called the Lady on the Grey. Yet because she does not have the impersonal, chilly menace of say, the Lady of the Cold in the Moomin books, Death seems a relatively benign presence here, and a comfortably far-off figure. Child readers will barely notice her. Or will think she’s rather nice. So much has been written about, and written by Neil Gaiman in his various incarnations that any attempt to retrace the territory here would be redundant. Suffice to say there’s the graphic novelist (Sandman) the screenwriter (Beowulf) the novelist for adults ( Anansi Boys, American Gods) the television scriptwriter ( Dr Who’s much-lauded “The Doctor’s Wife” episode) and the writer of other good children’s books such as Coraline….and that’s even before we get to Gaiman’s presence on the socio-cultural landscape as a relentless blogger and tweeter, as an in-demand public speaker (reported fee : $40,000 a time) as the good friend of Alan Moore and Tori Amos, and as the husband of Amanda Palmer of the Dresden Dolls. He’s prolific, and seems to be everywhere. Much as I like The Graveyard Book, there was a line in a terrific New Yorker magazine profile of Gaiman last year ( ( the article was called “Kid Goth” ) that keeps coming back to haunt me : “In Gaiman, the horror is domesticated, and made hygienic for contemporary tastes.” That’s a valid point. Among other things, it reverses the thrust of the usual concerns about Gaiman, that his stuff is too scary for kids. It isn’t, at least not for most 10-12 year olds who would be the starter group for The Graveyard Book. In fact, as the New Yorker profile point outs, parents generally find this stuff to be far scarier than their children do. Maybe that is the real point. For adults –and remember, it is adults who are buying the books in the numbers that propel Gaiman onto the bestseller lists, and keep him there – books like Coraline and The Graveyard Book offer the potential for catharsis, underneath all of the surface fun and excitement. Adults who live in a world rife with reasons for anxiety seem to enjoy Gaiman’s brand of horror lite – but perhaps only and especially because it comes wrapped in sentiments about the over-riding importance of family and community. That’s the deal he’s offering. Gaiman provides his legions of adult readers with a clear, bright and controlled version of their fears about the dark terrors and random cruelty the world can hold for children. He has been wildly successful in doing so because he is telling parents that it is all eventually going to be OK, while keeping faith (as he must) with his child readers that their hero will make it safely home through the night. 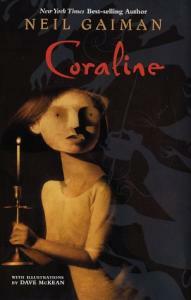 Coraline will survive her horrifying encounter with her Other Mother, and will rescue her parents and other children in the process. Doubly so, in fact. Not only does Coraline escape from the clutches of horror in its own den, she outwits the horror when it confronts her again in the real world, In similar fasion, Bod can finally sally forth confidently into the world – largely because his stolidly death-bound surrogate parents have furnished his life with such a loving foundation. This is good work to be doing, and someone has to do it. There are many people in Hollywood and elsewhere who are peddling uglier versions of the same unease. Even so, the retreat to family as the last line of cultural defence is a form of fundamentalism, as is the related belief that family is the source of the only emotions you can really trust. Love is fickle, family endures. That’s why we consume stories about endlessly resourceful kids, and the stop-gap families that we hope will keep them safe, even after their original families have been overwhelmed.